While I don’t often have white wine leftover, I usually always end up having extra red wine. 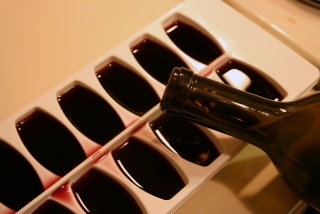 Instead of throwing it away, pour it in ice cubes and freeze to use later in sauces and braises! Saves money as well, especially if you need just a little wine for cooking purposes only…try it; it works! ← Mu Shu Chicken by Guy Fieri…A lot of ingredients but very tasty!